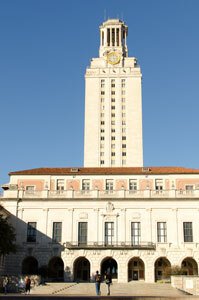 Located in a vibrant city known for its lakes, natural beauty, and creative people, the School of Information is one among thirteen other nationally ranked graduate and professional schools at the University of Texas at Austin (UT). As a part of the University, the School has access to the resources of the nation’s largest university--one growing in the center of a research and technology industry that also serves as a hub of the music and film industry. In 2017, US News and World Report ranked our program #5 in the nation. We were also ranked #2 nationally in archives and preservation, #2 in legal librarianship, #5 in digital libraries, and #10 in information systems. When founded in 1948 as a part of the UT Graduate School, coursework led to a Master of Library Science degree and to certification for school librarianship; comparable sequences are included among the School's current offerings. In 1967 the School initiated a sixth year of study, culminating in a Certificate of Advanced Study. In 1969-70 a trans-disciplinary doctoral program was added, leading to the degree of Doctor of Philosophy. The School's name was changed in 1980 to the Graduate School of Library and Information Science in recognition of the increased emphasis on information science in the curriculum as it had evolved since the late 1960s. At the same time, the name of the master's degree became Master of Library and Information Science. As recently as 2000 the master's degree name changed again to Master of Science in Information Studies. The change reflects the breadth and variety of information studies in the 21st century. Following much discussion on the topic of the School’s name, in 2002 the faculty voted unanimously to change the school name from the Graduate School of Library and Information Science to the School of Information. The new name took effect in 2003 to better reflect the diversity of issues and the multidisciplinary nature of studies in the information field. Today approximately 300 graduate students study in the master's, Certification of Advanced Study, and doctoral programs. The School of Information also offers a number of undergraduate courses. With more than twenty faculty, a range of joint appointees from across the University, and numerous adjunct faculty selected for their expertise in information studies, the School of Information balances the values of information access as a human and social benefit, with the intellectual and technical skills needed to lead developments in the information age.